No matter if you are moving two blocks away, or a bit further, in case you feel you can’t pull off your relocation, let local movers Massachusetts do that for you. When moving locally, one of the most important things is to be familiar with every street and corner of the area a moving company is operating it. The high-quality service and reliability Premium Q Moving & Storage can provide you with within their local moving service are what draws a great number of people to choose them when they need to relocate their home or even an entire business. As soon as you dial our number, you will realize why our clients feel so special when working with us. When it comes to preparing for relocation, if you do not take precautions such as finding a moving company which is truly trustworthy and is able to fulfill all your requests, then you are likely to be among those who have not had a very positive moving experience. But all those needless problems can be avoided by just investing a little bit of time in finding the right team to support you along the way. 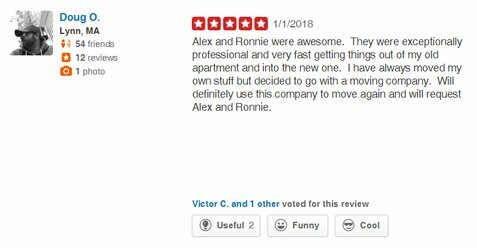 Over the years we have built experience, working on obtaining the highest set of skills in order o learn more and be the best choice our customers can make when thinking about hiring a local moving company. What we can offer you is specially designed to meet all the requirements you might have when it comes to moving. On the other hand, we truly believe that we should never stop growing and expanding knowledge. Therefore, although we know there is always room for an improvement, we also know that we are dedicated to always providing exactly what we are expected from our clients. We have built a circle of trust with all of our customers and we do not mean to break it! This is why we are the right choice for your move to or from Massachusetts. The list does not stop here. This is just a part of it in order to point out how much it is important to hire the crew that is really able to relocate you without any problems. No matter how complicated your moving is. With Premium Q, you can make sure that our movers are a perfect choice. They needed to go through a set of training to be qualified enough to become top-rated movers. All of them are equally able to perform all of our moving services that we can offer you. It is important to hire someone who possesses the right set of skills and is reliable. Since we take our job seriously, we also take all of our clients seriously. Hence, we always tend to perform at our best. Hence, you can expect nothing but excellence from all of us. We have developed a system which functions perfectly. We pay attention to all of your needs and tailor our services according to your requests. As a matter of fact, you can relax, knowing you and your belongings are in safe hands of our professional and licensed moving crew. We can assure you that we have a lot of love towards our job. Also, that nothing makes us more proud than when we know you are satisfied with our service. That is our greatest victory and that is exactly what want all of our clients to be like – satisfied. A part of being a member of a group of the best local movers Massachusetts is to know how to analyze the request sent by the client. From the first phone call all the way to the finish, we strive for delivering an outstanding service, avoiding making even the slightest mistake. Even if it occurs, we know how to quickly correct it. As for your move, we will make sure to think through your whole moving situation in order to create a strategy that will help you go through your relocation stress-free. We understand you can get worried about the price, but as a company with many years of experience behind them, we have decided to provide a convenience for our customers and offer a free estimate. That way you will be able to see where are you standing regarding your budget. But do not worry that much. Our company is always ready to find the best possible solution and help you move to the desired location in the Greater Area of Boston. One of the things we value the most is punctuality. We respect our client’s time and by no means tend to waste it. Therefore, once we make an agreement where and when to send our local movers Massachusetts, expect them to be there, fully ready and with the necessary equipment. For all of your questions, make sure to contact us, or pay us a visit in our office. 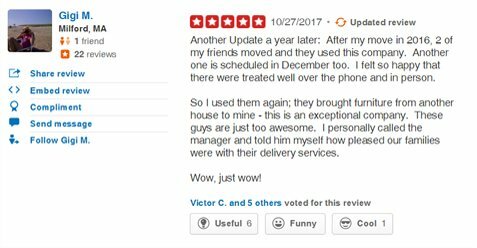 Remember, you deserve a great service, and local movers Massachusetts know how to provide it. Does an elevator or loading dock need to be reserved? We make this easy for you by providing you with the best time to make that reservation based on our accurate quote. If a parking permit is required at your origin or destination, we can apply on your behalf or explain to you in detail the process if you would rather apply on your own. Is a police detail necessary because you are moving out of or into a place on a busy street? Not a problem, we can help with that as well. Will a crane be required for any of the pieces? If you have big, heavy pieces that will require a crane, we will take care of it. You won’t have to worry at all about coordinating that additional piece. Is a certificate of insurance required? Many buildings today require a certificate of insurance, but don’t worry. The only thing you need to do in order to get one is share with us basic building information and we will take care of the rest of the certificate process.